TSP is a powerful, tried-and-true cleaning agent, but it's so potent that you must be very careful when using it. Read on to learn its rewards and risks. 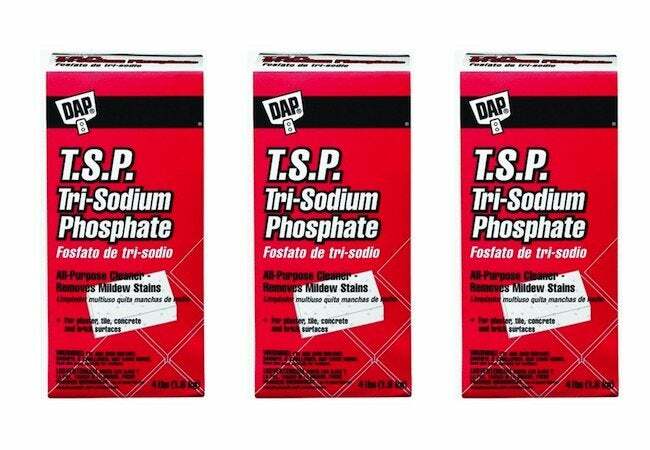 It wasn’t so long ago that trisodium phosphate (TSP) was a go-to choice for tough cleaning jobs. In recent years, however, the popularity of TSP has waned. There are no complaints about its performance—TSP was and remains a highly effective cleaner. Rather, an increasing number of people are steering clear of cleaning with TSP simply because, due to its potency, working with the stuff can pose dangers to personal health and the environment. Here, we look at both the pros and the cons of working with a TSP cleaner, leaving you to decide whether or not it’s the right choice for you and your family, your home, and the situation at hand. There’s little doubt that TSP cleaner works great. In fact, it often succeeds where other solutions fail to do the trick with the most stubborn stains. You might expect that using such a powerful cleaning agent would entail a complicated procedure, but once diluted, TSP can be applied simply with a brush or sponge, or via a sprayer. 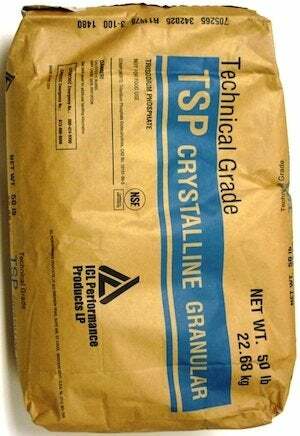 TSP is suitable for use on a variety of materials, including brick and stone, cement and wood. But if any of those surfaces are painted, you should expect to repaint after cleaning with TSP. That’s fine, because much of the time, TSP is used for cleaning surfaces in the course of preparation for painting, particularly for exteriors. If you’re using TSP to clean siding, speed up the job with a power washer. Don’t own one? Rent the tool from your local home center. Doing so may set you back a few bucks, but you’ll save endless trips up and down the ladder. Note: one benefit of washing exteriors with TSP cleaner is that, when combined with household bleach, it eliminates mold and mildew. That said, if using TSP outdoors (especially if mixing it with bleach), be sure to protect your landscaping. Choose a windless day for your project, and hose down any nearby plants, shrubs, or tree branches, both before and after the job. Avoid cleaning with TSP in the bathroom; it can damage metal, ceramic tile, grout, and glass. And as discussed above, it’s not suitable for painted surfaces. Being toxic, TSP must be handled with care. That means wearing the appropriate protective gear. T-shirts and shorts are a no-no. Instead, wear full-sleeve clothing in addition to gloves, glasses, and a respiratory mask. And if you’re going to be working indoors, you must adequately ventilate the area. TSP cleaner can also be bad news for the environment. If it ends up in lakes and streams, the phosphates trigger an overgrowth of algae that results in a depletion of oxygen levels in the water, which endangers fish and aquatic plant life. Use only as much TSP as you need, and tightly control the runoff. You should also be aware that, given the drawbacks of TSP, some municipalities have either limited its use or banned its use altogether. Before starting your cleaning project, be sure to check local regulations. Also note that on the shelves of your local home center you may not find TSP, but TSP substitute instead. The latter is much safer to use, but most agree that it doesn’t clean as well as the real stuff.